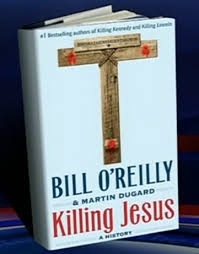 Killing Jesus (I would suggest the title: Killing the Story of Jesus) is the latest in the “Killing” trio of books penned by the Bill O’Reilly/Martin Dugard team. Since I’ve not read the previous two (Killing Lincoln and Killing Kennedy) I have no idea if this installment in the series follows the same pattern, but if so, it sure didn’t commend the others to me. The book is presented as a “history”, and promises to present the life of Jesus as never before. Having not read every book which attempts to give the history of Jesus AS history (and there is a plethora of them) I’ve no idea whether or not the O’Reilly/Dugard book lives up to its claim. That said, I HOPE its not been done this way before, because it is in the final analysis – done so poorly. Apart from some glaring factual errors (like assigning the fall of Israel to the Philistines in 722 BC – It was actually the Assyrians), referring to raising of Lazarus from the dead as a “legend” rather than a fact, and minimizing Jesus’ other miracles, the book is just plain boring. A crime of unspeakable proportions when we are discussing the incarnation of God, His life on earth and and His redemptive cross-work. I can forgive O’Reilly’s penchant for making himself seem smart and clever by over-plying and over-playing obtuse terminology. Anyone who’s listened to him at all has come expect that. Though what can be clever and entertaining at times – when overused (as in this case) becomes merely annoying. And I understand that the rise of “historical fiction” in our generation (a sad trend WAY overindulged in Christian books today) seems a tantalizing way to present old or well known facts interestingly to a new audience. But when they say assert that Jesus’ interaction with the teachers in the Temple when He was 12 years old happened the afternoon of March 23rd, AD 7 – you just have to say – Really? They KNOW that? How? It is a foolish assertion impossible to verify. But that doesn’t stop their “history”. In fact, such is their commitment to “history” that in explaining their approach to the life of Jesus and using various extra-Biblical sources they can state: “Of course we have the Gospels of Matthew, Mark, Luke and John, but they sometimes appear contradictory and were written from a spiritual point of view rather than as a historical chronicling of Jesus’ life.” Apparently, in their view, Luke’s introduction to his own Gospel fails to be a “historical” chronicle when it reads: “Inasmuch as many have undertaken to compile a narrative of the things that a﻿have been accomplished among us, just as those who from the beginning were eyewitnesses and ﻿ministers of the word ﻿have delivered them to us, it seemed good to me also, having followed all things closely for some time past, to write ﻿an orderly account for you, most excellent ﻿Theophilus, that you may have certainty concerning the things you have been taught.” O’Reilly and Dugard display a mistrust of the Biblical text at best and a total disregard for its inspiration at worst. In their defense, I must add that to those who try to understand the Person and Work of Jesus in a purely human/historical context apart from a redemptive/historical one, His birth, life, death, burial and resurrection are not compelling. They make little sense. O’Reilly and Dugard are trying their best to make sense of Jesus’ death at the hands of the Romans and the insistence of the Jewish hierarchy. Hence they try to make the story about Jesus’ being anti-tax or anti-Roman government or anti-Jewish establishment. They have to lean on these categories because they have no redemptive category to work with. Such an approach makes for both lame history and lame narrative. Apart from Jesus coming as God robed in human flesh for the purpose of fulfilling the law both in precept and penalty – and His substitutionary death on the cross for our sins – the narrative DOESN’T make sense. The failure to reckon with the facts of redemption in telling Jesus’ story leaves you with nothing but a hollow figure, with no substance. A cloud that has the appearance of something substantive, but upon contact is but vapor. You would think that they MUST have felt that horrible hollowness. But by their subsequent pride in their final product, that seems to have escaped them. I would have thought no one could take the exciting, time-transcending, soul-transforming, eternal wonders of the Person and Work of Jesus and make them boring, mundane, meaningless and in need of being spiced up by false drama and contrived conversations. I was wrong. O’Reilly and Dugard have done it. Tragically. Want a thrill? Pick up your Bible and read the story of Jesus. The way the Holy Spirit breathed it out into original writers. Thrill to the wonder of God coming in human flesh in the person of Jesus. Hear Him teach the mysteries that had been hidden from the beginning of the world – hear Him as THE mystery made manifest for the salvation of lost souls. Watch Him manifest the life of God everywhere He goes. Weep with joy as He crushes the power of the enemy and in healings and miracles gives us a foretaste of the Kingdom to come. Marvel as He takes our illness and bears our diseases, as He fulfills all the prophecies and promises the Spirit uttered through the mouths of the prophets of the Old Testament. Hear Him overwhelmed in the Garden in prayer, forgiving sins and then praying while being crucified in our place for our sins – until at last “it is done.” Wonder at His empty tomb and His promise to return for us – honoring us with His commission until He returns. Understand Him reigning on high, sending His Spirit to indwell every believer and awaiting the day when He will gather up His own to eternal glory while meting out absolute holy justice on the nations. Anticipate the promised blast of “last trumpet”, the final defeat of Satan, the great “white throne” judgment, the marriage supper of the Lamb, the new heavens and the new earth and everlasting joy in the presence of His unveiled glory for all those who have been redeemed by His blood. Read that. And don’t waste either your time or your money on the O’Reilly/Dugard version. It isn’t worth it. Why spend time staring at a distorted shadow when the real thing is right in front of you?